Mobile Hotspot is one of those useful features which we revert to when we don’t have a Wi-Fi connection but we still want to use Internet on our smartphones and tablets and laptops. Of course, it can turn out to be a tedious task for some, and hence, Google is rolling out a feature called Instant Tethering which will make connecting to your mobile hotspot simpler and faster. Let’s say you a have a smartphone and a tablet and you rely on your Wi-Fi connection for accessing Internet. Well, if for some reasons, the connection to your Wi-Fi drops or if it’s not working, most of you would turn on the mobile hotspot on your smartphone. And to do so, you will first turn off the Wi-Fi on your smartphone, then enable mobile data and then turn on the mobile hotspot. Quite a few steps they are, aren’t they? Well, Google makes this process automatic with Instant Tethering. With Instant Tethering, as soon as the connection drops, you will get a prompt on your tablet (shown above). Once you tap on Connect, your smartphone will disconnect from Wi-Fi, enable mobile data and then turn on the mobile hotspot. Your tablet will also connect to your mobile hotspot automatically. You won’t have to do anything manually. Besides this, you will also be able to see how much battery is left on your smartphone from your tablet. 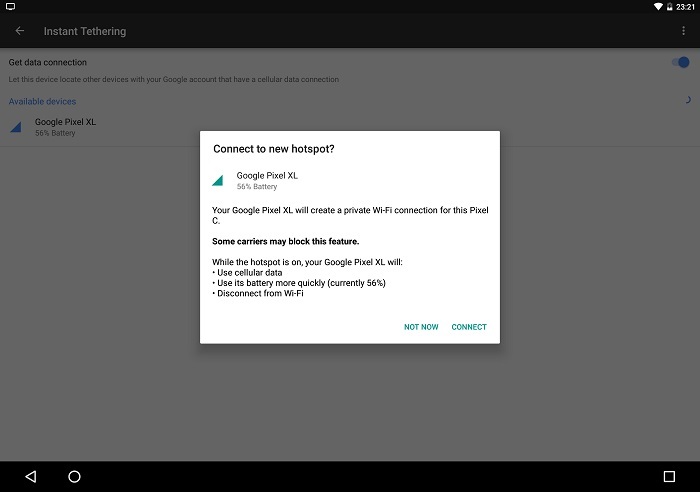 Of course, Instant Tethering would only work if both your Android devices are latched on to the same Google account. Instant Tethering is being rolled out as a part of Google Play Services 10.2 and is first rolling out to devices running Android 7.1.1 Nougat i.e., the Nexus and Pixel devices. While the Nexus 5X and 6P along with the Pixel and Pixel XL can provide connection by working as mobile hotspot, the Nexus 9 and Pixel C would only be able to get connection and not provide one. Instant Tethering can be enabled from Settings > Google menu, however, if you don’t see it there, it’s only because Google hasn’t enabled it from the server. 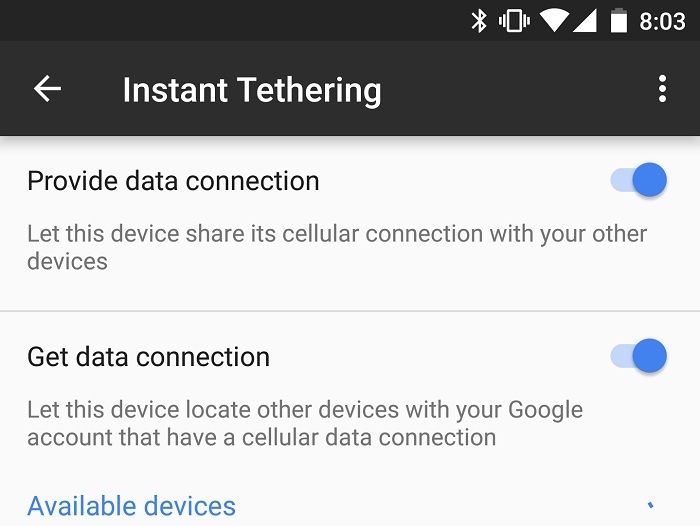 Hence, even if you install the Google Play Services 10.2 apk on your device, you will only see the Instant Tethering option when its enabled from the server.